Around 1800, the Swiss mechanician and clockmaker Henri Maillardet (1745-1830), who worked then in London, created an extraordinary automaton, known as the "Draughtsman-Writer". In fact, Maillardet's "Draughtsman-Writer" was a part of large collection of automatons (some 10 machines), created (or at least demonstrated) by him in early 1800s. The "Draughtsman-Writer" (see the lower images) had the largest "memory" (cam-based) of any such machine ever constructed, enough to demonstrate the creation of four drawings and three poems (two in French and one in English). The "storage capacity" of the automaton, needed to store seven images within the machine, can be calculated as 299040 points (almost 300 kilobits). 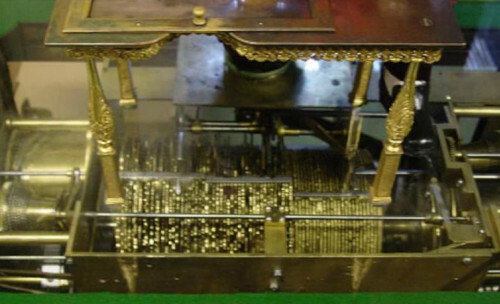 This remarkable for the time capacity was achieved by placing the driving machinery in a large chest that forms the base of the machine (see the upper photo), rather than in the automaton's body. 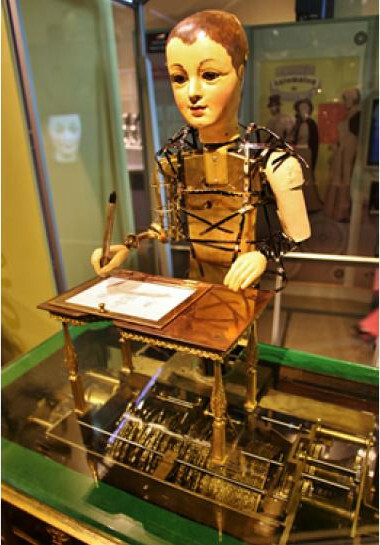 The "Draughtsman-Writer", still preserved in the Franklin Institute science museum in Philadelphia, is a spring-activated automaton that draws pictures and writes verses in both French and English. The motions of the hand are produced by a series of cams (brass disks) located on shafts in the base of the automaton, which produces the necessary movement (through a complex system of levers and rods) to complete the drawing of seven sketches and text. Jean Henri Nicholas Maillardet was born in Meyriez (the canton of Fribourg) in Switzerland on 19 November 1745, as the second son of Henri Maillardet (born in 1720 in La Chaux-de-Fonds - died in 1758), a community leader of Fontaines, a municipality in the canton of Neuchâtel, and Marguerite Maillardet (born in 1721 as Kolbe). Henri married Marguerite Kolbe in 1739, and they had five children. Henri Maillardet Jr. started his career as a watchmaker in Fontaines and from 1768 until 1770 together with his brother Jean-David worked as pendulistes in Königliche Uhrenfabrik (Royal Watch Factory) in Berlin under Abraham Huguenin. 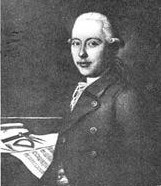 Abraham Louis Huguenin (1733-1804) was a brilliant Swiss watchmaker, who was the director of Königliche Uhrenfabrik since 1765 until 1770, when the factory was closed. In 1770 Henri Maillardet already worked for Jacquet-Droz and together with Jean-Frédéric Leschot and Jacob Frisard took part in the construction of three androids, which were finished in 1774, when Jaquet-Droz presented the androids (the Writer, the Artist and the Musician) to the public in La Chaux-de-Fond. They are still functional today in the Musée d'art et d'histoire de Neuchâtel. In late 1770s Jacquet-Droz opened a production studio in the village of Fontaines, and Henri Maillardet, together with his brothers, worked there for several years. The bulk of the production was destined for the Chinese market. Henri Maillardet's brothers—Jaques-Rodolphe (1743-1828) and Jean-David, also worked in the field of automatics. Jean-David Maillardet (23.05.1748-15.11.1834) also became a famous clockmaker and automatist, and after working some time in Germany, he established himself in Fontaines, where he became a friend and partner of Jacquet-Droz. Jean-David built many automata, in particular magicians, together with his son, Julien-Auguste (1779-1852), who also became automatist and clockmaker and worked with his father at Fountains. They even designed a perpetuum mobile, a gravitational engine that offsets the weights at 12 h and put them back to their original position at 6 h.
In 1783 Jaquet-Droz opened a studio in London (in Bartlett's Building in Holborn), and the management of the studio took namely Maillardet. The contract was signed on 10 May 1783, establishing a London branch of the Jaquet-Droz business, called Jaquet-Droz & Leschot, and Maillardet directed the business in London for more than 30 years, until 1815. The tools belonged to the two partners equally, Maillardet was to receive a salary of £27 annually and the same sum for each of the workmen or apprentices that he needed to feed and house. Unfortunately, he firm was in trouble by the late 80s and in liquidation in both London and Geneva after Pierre Jaquet-Droz's death in 1790 and that of his son Henri-Louis in 1791. There follows a long list, with details of the actions of some of the figures, which included La Belle Roxalana (a musical lady), The Juvenile artist, The Little Spaniard, an animated Rope Dancer, An Old Necromancer, a Humming Bird, a Phenomenon Automaton Pedestrian, a Beautiful Gold Serpent, a Siberian Mouse (see the lower photo), an Ethiopian Caterpillar, an Egyptian Lizard and an Aranea. The "Siberian Mouse"—a 5.5 cm long pearl, gold and enamel automaton of Henri Maillardet, circa 1805. Sold for 365000 GBP on a Sotheby's auction in July, 2015. When a button below the perky mesh tail is pressed the mouse skitters, twirls and pauses to sniff the air and nibble in a most realistic manner. Soon after obtaining the good job in Jaquet-Droz & Leschot in London, in 1784 Henri Maillardet married to Jeanne Louise Catherine Mourer (born in 1750 in Lausanne). Two sons from this marriage are known—Edward Frederick Maillardet (born in 19 August 1786 in London, he became a dentist), Henry Maillardet (b. 1791), and a daughter, Louisa Henrietta Maillardet (b. 18 March 1785). The years between 1791 and 1798 were spent by Leschot in Geneva and Maillardet in London, attempting unsuccessfully to recreate the earlier successes of Jaquet-Droz company. By 1798, Maillardet seems to have changed direction and set himself up as a showman. He took over the former premises of Cox's Museum, the Great Promenade Rooms in Spring Gardens. Here, gradually acquiring new attractions, he showed his Wonderful Automatons... consisting of the Mechanical Musical Lady; the entertaining Fortune-Teller; the pleasing Tumbler; and the wonderful Writing Boy, with the beautiful Singing Bird in a Gold Snuff-box. Also a Siberian mouse etc., etc. The "Ethiopian Caterpillar"—gold and enamel, diamond, emerald, and pearl-set automaton caterpillar, made up of 11 graduated segments. Dimensions: length 70 mm, thickness: 15 mm. Brass, shaped, with fixed barrel, the 5-wheel train terminating with 2-arm fly governor. A cam fixed to the extension of the second wheel moves two levers up and down, resulting in a very realistic crawling motion, small knurled steel wheels running via contra wheel meshing with the second wheel pinion, make the caterpillar move forward. In fact, it is still disputed as to whether all the large and small automatons, demonstrated by Maillardet, were the work of Henri Maillardet himself, the Maillardet family, or supplied to Maillardet by an unknown maker. However, there in no doubt, that Henri Maillardet was a brilliant mechanician, so most probably the movements were invented and made by himself, while the beautifully-enameled and bejeweled gold exteriors were created in Switzerland. Sadly, although apparently retaining a financial interest in the collection of automata for many years as it was taken on tour round Britain by various successors, last years of his life Henri Maillardet fell on hard times and died in penury, in Mechelen, Belgium, on 23 August, 1830. The "Egyptian Lizard"—gold and enamel, pearl- and emerald-set automaton. Dimensions: length 59 mm (180 mm with the tail), 12 mm thick. Brass, rectangular, with going barrel, the 3-wheel train. The second wheel (contra) is fitted with a milled disc with two notches to produce a vibrating motion with two levers transferring it to the feet giving the feet a very realistic motion, the lizard moves via two small knurled steel wheels mounted on the last train pinion.